Hello Kitty Darth Vader is licensed under a Creative Commons Attribution 3.0 Unported License. Permissions beyond the scope of this license may be available. My wife and I finally finished this art project for my daughter, a custom, full-sized Darth Vader helmet in the style of Hello Kitty. This is not a Photoshop manipulation. Would you like to see more Cool Things My Wife Made? This photo was posted to Flickr on 28 June 2009. It was one of 500 images featured on Flickr Explore for that day. The last time I checked, it had 43,631 views on Flickr. Darth Vader is the central character in the Star Wars universe. Created by George Lucas, the character was the primary villain in the original trilogy Star Wars (1977), Star Wars: The Empire Strikes Back (1980), and Star Wars: Return of the Jedi (1983), but he was one of the heroes in the prequel trilogy Star Wars Episode I: The Phantom Menace (1999), Star Wars Episode II: Attack of the Clones (2002), and Star Wars Episode III: Revenge of the Sith (2005). His story is one of tragedy as the young Anakin Skywalker is lured away from his Jedi mentors to the Dark Side of the Force by Emperor Palpatine and eventually betrays everyone he ever cared for. In the original trilogy Darth Vader was played primarily by David Prowse and voiced by James Earl Jones. Anakin Skywalker was played by Jake Lloyd and Hayden Christensen in the prequel trilogy. Darth Vader is a powerful character and perhaps the most iconic figure in the Star Wars saga. 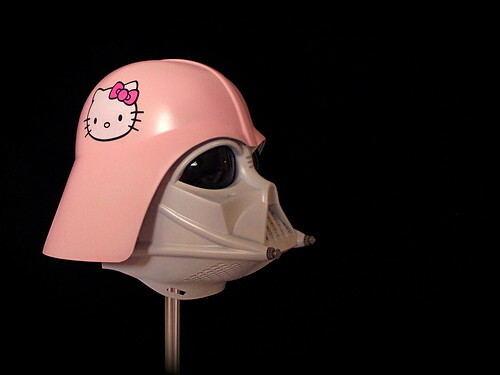 Hello Kitty Darth Vader by JD Hancock is licensed under a Creative Commons Attribution 3.0 Unported License. Permissions beyond the scope of this license may be available.